Far from all standard accessible toilets meet the needs of disabled people – or the needs of their carers and families. As a result, they are not able to take part in activities that many take for granted and they cannot visit public places like shopping centres, leisure venues, hospitals, and transport hubs. We think everyone has the right to visit and have equal access to the facilities in public places without putting the health and safety of themselves, their carers and families at risk by having to use the toilet floor for changing. When you install a Changing Places Toilet, you ensure that people with profound and multiple learning disabilities and people with other physical disabilities that limit mobility have access to a fully accessible toilet, a Changing Places Toilet, which is safe and comfortable. What do you need to install a Changing Places Room? A Changing Places Room is a fully accessible toilet with the right equipment and generous space for the disabled person and up to two carers plus their equipment. The toilet should be centrally placed with room on either side for the carers, and a screen or a curtain should be mounted to allow some privacy for the user. For a Changing Place, you need a height adjustable changing or showering bench that is minimum 180 cm long and can carry a 125 kg load. With its ergonomic design and electric height adjustment, the ROPOX Shower/Changing Bed is an ideal solution for Changing Places. The soft and flexible slats provide a comfortable position for the user. The carers can easily adjust the bench to the most comfortable height when helping the user, and they can help wheelchair users to transfer smoothly onto the bench with minimum physical strain. When the shower/changing bed is not in use, it can be folded up to free space in the Changing Place. 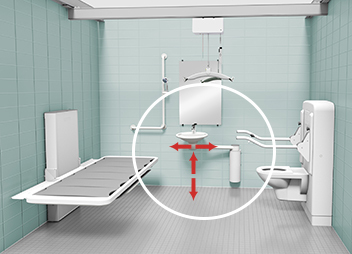 The ROPOX Changing/Shower bench has electrical height adjustment from 30-100 cm, it is approved to a max load of 220 kg and is available in several lengths (maximum length 210 cm). 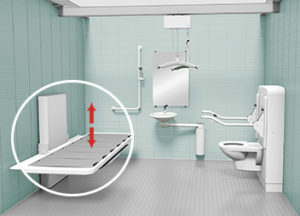 To create the most disability-friendly Changing Place, a height adjustable washbasin is preferred, and it should have generous space for the legs underneath it. In our range of washbasins, both the ROPOX SlimLine and ROPOX SwingLine are height adjustable, and they are explicitly designed for disabled people. SlimLine is a slim and elegant and electrical height adjustable washbasin where the mirror and washbasin are combined in one unit. It has integrated grabs on the front edge and a smooth surface with rounded corners. Although slim and elegant, the washbasin is exceptionally durable and reliable in usage. 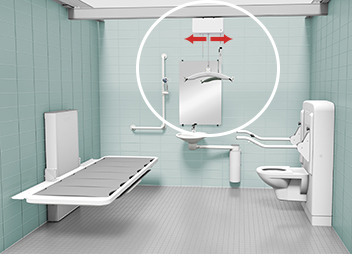 The SwingLine washbasin (on photo) is perhaps the most user-friendly solution for wheelchair users and walking impaired: It is manual height adjustable, there is plenty of legroom, and it is movable. You can pull the washbowl out from the unit and bring it within the user’s reach, and you can push it to the corner of the room to create the largest possible turning area for wheelchair users. In a Changing Place, there should be a peninsular toilet to ensure generous space on either side for the carers to support the user. For people with limited mobility, the ROPOX Toilet Lifter is an aid to get on and off the toilet. The Toilet Lifter gently lowers and lifts the user the seated or standing position using electric height adjustment. The aid has a smooth surface with nicely rounded corners. The hand control is easy to use, and the user can set the height from 40,5 to 80,5 cm. The Toilet Lifter can be combined with all standard wall-hung toilets, and it is approved for a maximum user load of 400 kg. To add to the safety of the Changing Place, you can install ROPOX Toilet Support Arms that provides extra support when using the toilet. For people with reduced mobility, the toilet arms serve as stable support when sitting down and they provide a firm grip to lean on to when getting into standing position again or when transferring on a wheelchair. The ergonomic design with a non-slip surface is comfortable to touch, and you can adjust the Support Arms in height and in different angles to suit the user’s needs. Grabs and shower rails placed at the right places makes the Changing Place a safer environment. They provide that little extra to make the user feel comfortable when using the Changing Place. The ROPOX Grabs and Shower rails are designed with an even, smooth surface without any dirt traps. This makes cleaning easier, and it also helps to maintain a high hygiene level. When installing a Changing Place, a tracking hoist system is strongly recommended. 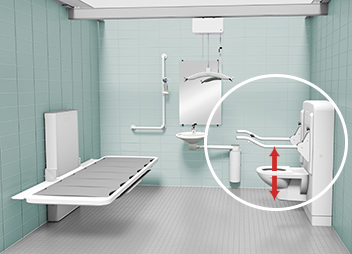 The hoist helps the carers to transfer the users to the toilet, washbasin and changing bench in a way that is gentle and comfortable for the user while ensuring the optimum working conditions for the carers. The Guldmann ceiling hoist system is a discreet and almost invisible lifting module that ensures safe and comfortable lifts and an ergonomically safe working environment for the carers. It provides full coverage in the Changing Rooms, and when combined with a Guldmann Lifting Hanger it is an obvious choice for personal care procedures in a Changing Place. You can find a detailed guideline on www.changing-places.org. It is not always possible to design a changing room with the 4 x 3 m room layout. In those cases, you need innovative product solutions, that can make smaller rooms work almost just as well as the full sized ideal. In school buildings, you can address the needs of disabled pupils or students by installing a Hygiene Room that caters for children with special needs. A hygiene room provides a combined toilet and changing facilities, and they include a fixed or mobile hoist, changing bed, an accessible toilet and space for assistants to change pupils. Who can use a Changing Places Room? A Changing Places Toilet – or CP Toilet as some call it – is used by people with profound and multiple learning disabilities, muscle-wasting conditions, motor neurone disease, multiple sclerosis and cerebral palsy. People who have suffered major physical trauma, had a head injury or stroke as well as some older people may also need a Change Places facility. Where are Changing Places Toilets needed? To enable all disabled people to go out, Changing Places toilets are required in all big public places. This would allow people with profound and multiple learning disabilities and people with other physical disabilities to visit shopping centres, leisure venues, hospitals, transport hubs and airports. Naturally, the equipment used to install a Changing Place Toilet must meet the relevant standards to ensure that the health and safety of the users and the carers are not put at risk. The British Standard BS8300 sets out how buildings should be designed, constructed and maintained to ensure that everyone can use a building’s facilities equally. ROPOX products are of course fully compliant with BS8300 and with the guidance given in Doc M of the British Building Regulations. At Changing Concepts you will find guidance on how to create a Changing Place Toilet, a Hygiene Room or a Space to Change, and the ROPOX products and the Guldmann hoist system proposed all meet or exceed the relevant standards and regulations. This means that you can be confident that the equipment is safe, durable and reliable in use.